Two of the most commonly used types of radar transmitters on the market today is Guided Wave Radar and Non-Contact (pulse) Radar. 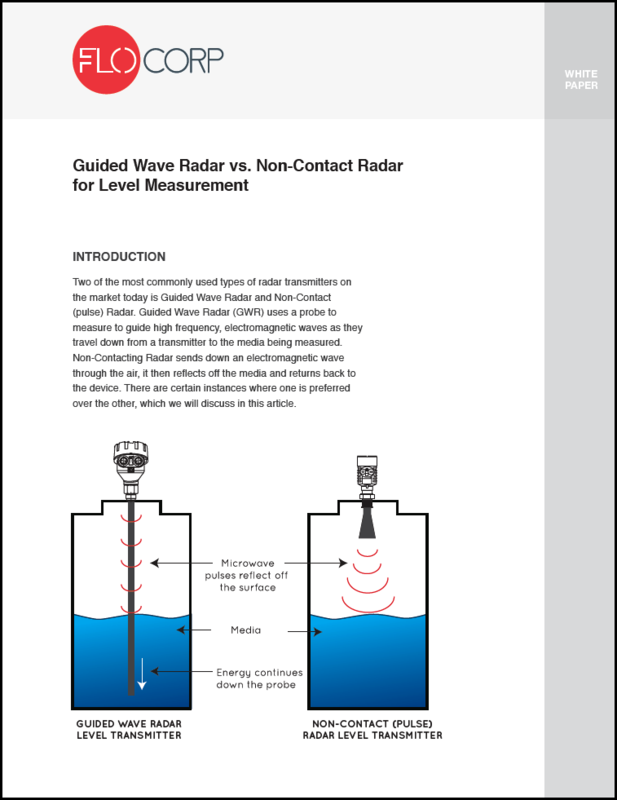 Guided Wave Radar (GWR) uses a probe to measure to guide high frequency, electromagnetic waves as they travel down from a transmitter to the media being measured. Non-Contacting Radar sends down an electromagnetic wave through the air, it then reflects off the media and returns back to the device. There are certain instances where one is preferred over the other. 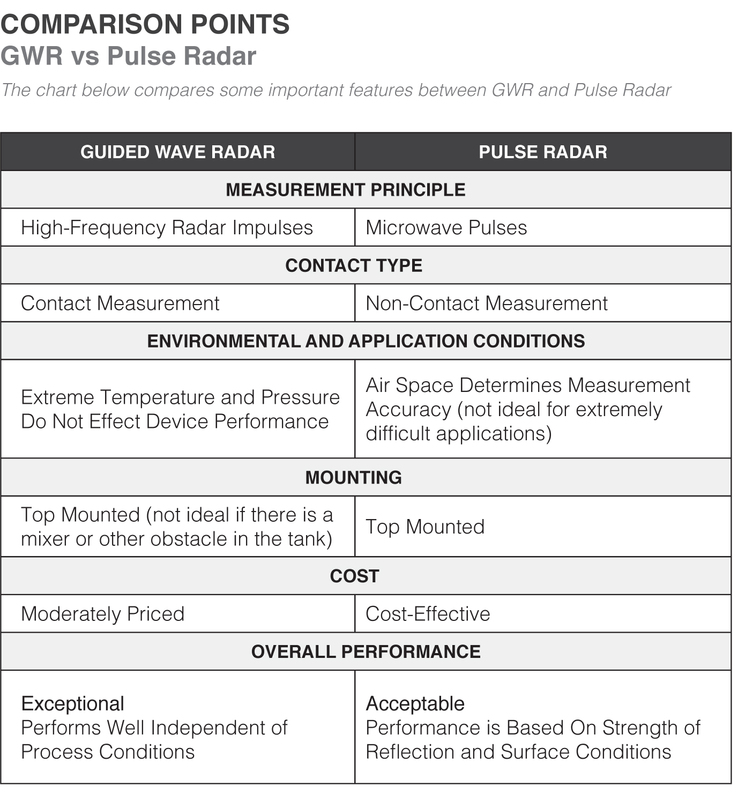 In this article we will discuss Guided Wave Radar vs. Pulse Radar Level Transmitters. GWR is based upon the principle of Time Domain Reflectometry (TDR), which is an electrical measurement technique that has been used for several decades in various industrial measurement applications. With TDR, a low- energy electromagnetic pulse is guided along a probe. When the pulse reaches the surface of the medium being measured, the pulse energy is reflected up the probe to the circuitry, which then calculates the fluid level from the time difference between the pulse sent and the pulse reflected. The sensor can output the analyzed level as a continuous measurement reading through its analog output, RS-485 communications output, or optional switching output depending on output options required. GWR technology also has the ability to measure a liquid interface. A liquid interface is the ability to detect the top liquid level of the media as well as the “interface level” or level of the media that is below the liquid level, which contains a different dielectric property or physical property than the top liquid level being measured. 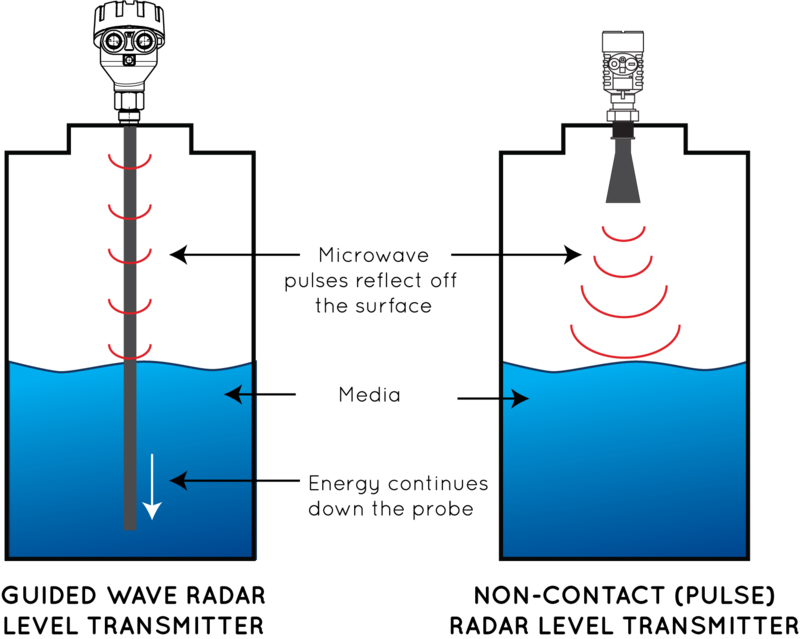 A typical application would be an oil and water interface, in which the oil being of a lighter specific gravity and lower dielectric than water would be measured as the top liquid level and the water would be the interface level. One of the most common misconceptions of GWR is that material would stick to the probe overtime resulting in inaccurate level readings. 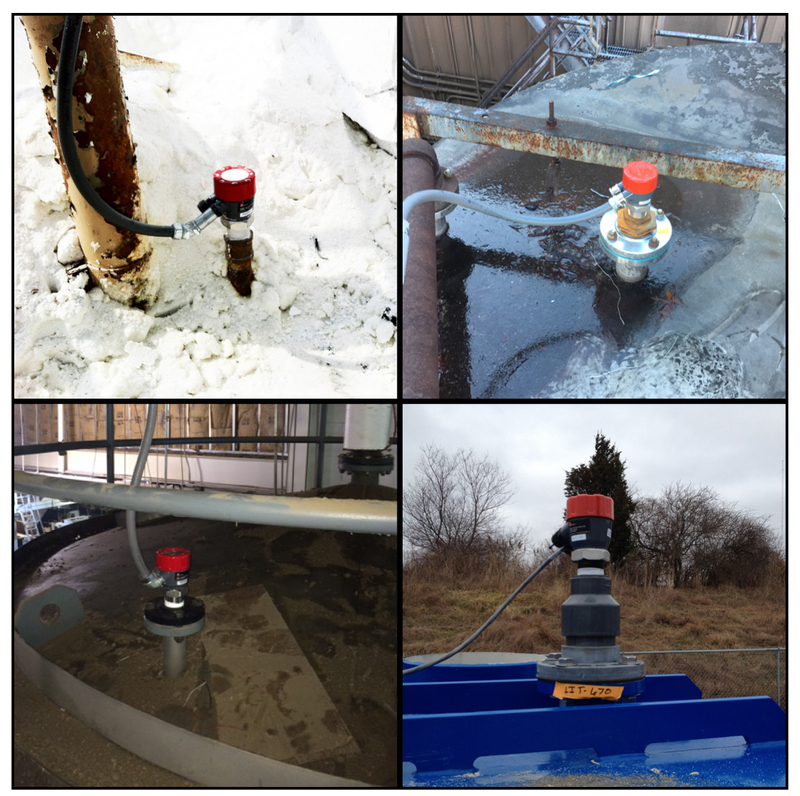 GWR Technology is so advanced that accurate level measurements are still performed even with build-up on the probe. The radar signal of GWR has a very large detection area around the probe covering 360º of area over several feet of coverage. When this pulse energy comes in contact with a mass of product on the probe, the signal is returned and analyzed to see if it is the true liquid level. Since the liquid level always has a larger signal return than the smaller mass that is sticking on the probe, the liquid surface is easily identifiable. The advanced algorithms developed over the last decade have made this contacting form of level measurement the ideal solution for even the stickiest of fluid applications. 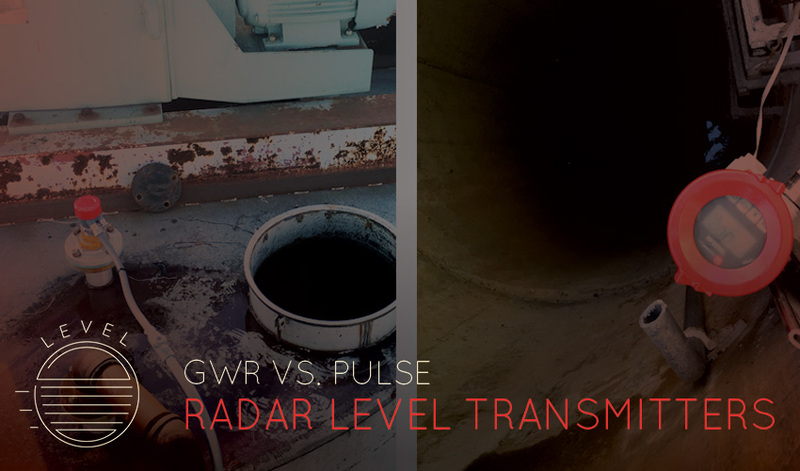 GWR level transmitters are able to accurately measure both liquid and solid media. Changes in viscosity, density, or acidity do not affect accuracy. Performance is not affected by agitated surfaces such as boiling liquid, dust, foam, or vapor. The GWR has extreme operating capabilities and performs well under extreme temperature (up to 600ºF). It is capable of withstanding pressures up to 580 PSIG. It performs well in difficult applications such as fine powders and sticky fluids. Some applications that GWR is commonly used in is paint, latex, animal fat, soy bean oil, saw dust, carbon black, titanium tetrachloride, salt, and grain to name a few. Non-contact radar or pulse level radar as it is commonly referred to in the industry features through the air technology, which emits narrow microwave pulses down the cone shaped antenna. The microwave signal comes in contact with the measured medium surface and reflects back to the antenna. The signal is transmitted to the electronic circuit and partly converts to level signals (as microwave featured with high propagation speed, it is almost instantaneous for the electromagnetic waves to reach the target and return to the receiver). Pulse radar transmitters are able to accurately measure both liquid and solid media. They are very cost efficient and easy to use. 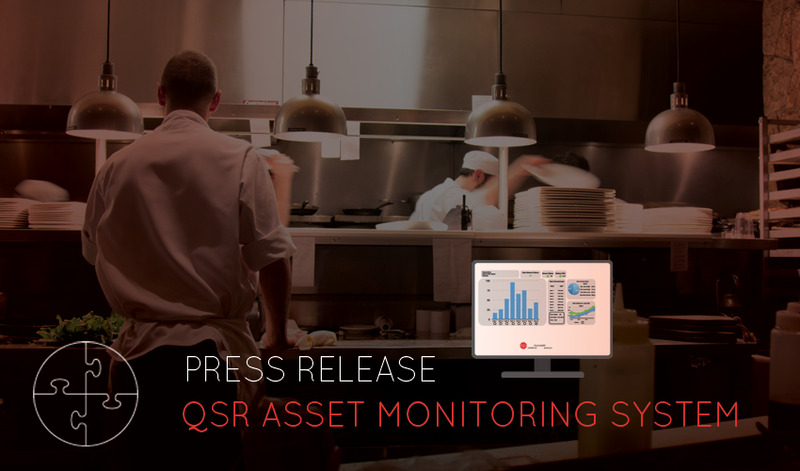 Since the probe doesn’t need to come in contact with the media, it is great for industries such as food and beverage, medical, chemical and petrochemical, and oil and gas. 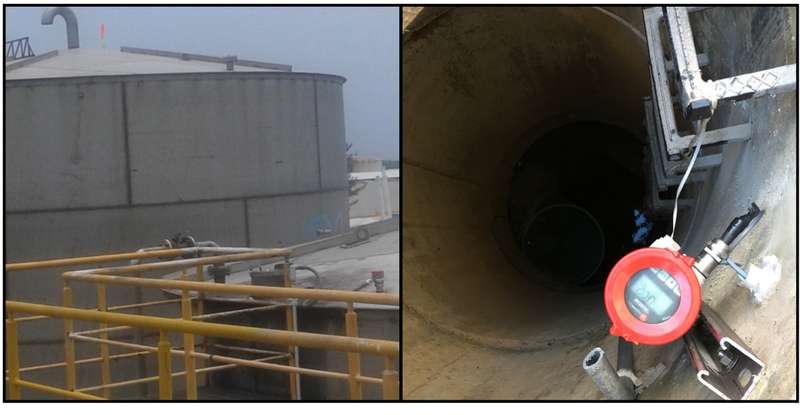 Typical applications include corrosive or non-corrosive liquid level monitoring, sanitary environments, caustics, small tank or process vessel, silos, and tote tanks.